Just made home-canned jars of tomatoes fresh from the garden–mostly Purple Cherokees, filled in with plump grape tomatoes. I thought I probably wouldn’t can tomatoes this year. Last year, I hadn’t. Because of the still dry conditions, except for the grape tomato, the plants didn’t produce much at all. Also, this year I only set in seven plants: three Purple Cherokees, three hybrids that bear pretty large fruit, and another grape tomato. If you want a plant that continues bearing for a long time and lets you almost daily grab enough tomatoes for your salads, I recommend planting grape tomatoes. With just a couple of plants, you can harvest daily the same amount of tomatoes that you will pay $2.50 per container (or more) at the super market. 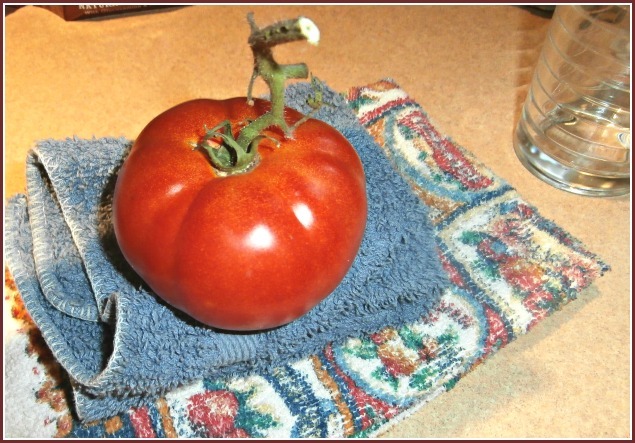 Of course, if you want the big, beefy slicing tomatoes that go great in a sandwich, there is none better than the heirloom Purple Cherokee; though even the hybrids picked fresh from the garden are nightly tasty. Nothing better than a juicy tomato straight from the patch behind the garage. With the rain this year, my tomatoes have been doing well, but with the onset of higher temperatures, the big tomatoes are no longer setting on. I’ve already shared with friends, so more of the tomatoes getting ripe at the same time, I decided to look to see (Don’t you just love this redundancy!) if I had all the necessities for canning tomatoes. It doesn’t take much: jars, lids, rings, and several pots for water. I also have real canning tongs; something we didn’t have out on the farm. Some say you have to have a pressure cooker for canning, but I do it the way my mom did, just using a big kettle with a lid and have always had good results. The recipe is pretty simple, but I dug out the recipe card, one of many that I have in my mom’s handwriting. Her distinctive writing and the whole process itself brings back a lot of good memories of helping with the canning when I was a kid out there on the farm in Kansas. Fill 3 pots with water and put them on the stove to simmer. You’ll need 2 smaller pots, one to scald the jars and one to blanch the tomatoes. You’ll need another pot big enough to hold the filled jars for the actually canning. I have one that will hold 6 pints or 4 quarts. I sanitize the jars by dipping them in one pot of boiling water. You can also do this in the dishwasher or by pouring scalding water into and over them in the sink drainer. Let them drain on a towel on the counter. Then put sealing lids in the water to sanitize and heat up. Meanwhile, fill a large bowl with ice and water and put it in the sink. Turn the jars right-side up and put them near the sink in order to have them ready for the tomatoes, once peeled. Start dipping clean, washed tomatoes into the hot water in the other smaller pot, one or two at a time. Leave them for about 20-30 seconds. Use a big slotted spoon to dip them out of the pot and plunge them into the ice water for just a few seconds. The skins should peel off easily. Use a paring knife to cut out the stem areas and any blemishes. Now fill the jars with the peeled tomatoes. Smaller tomatoes can go in whole; larger ones should be cut into halves or quarters. As you fill the jars, gently push down the tomatoes with your fingers to eliminate air pockets. Fill the jars to approximately 3/4 inch from the top. Make sure that no tomatoes will be sticking up against the lid. Now add salt to each jar: 1/2 teaspoon for pints, 1 teaspoon for quarts. (Some recipes also suggest adding a spoonful of lemon juice.) Next, wipe all around the rim of the jar with a clean, damp cloth to remove any tomato bits, salt, or liquid. Now remove the lids from the simmering water with a spoon or tongs. Be careful; the lids will be hot! Put the lids on the jars and screw on the jar rings. The rings should be tight, but not necessarily muscle-man tight. I twist the lids on as tightly as I can and then loosen them back just a tad. Remember that the rings are there to hold the lids on during the canning; they really aren’t what is actually sealing the jar. You’re ready to put the filled jars into the big pot of simmering water. How much water to start with is always a guess, but you want the water to cover the jars by about an inch once you have them all in the pot, so don’t overfill. If I need more water, I just pour some from the pot that I used for sanitizing the jars. Use the canning tongs to carefully stand the jars in the pot. My mom always placed a dishcloth on the bottom of the pot for cushion, but I don’t do that. Cover the pot with its lid. The jars of tomatoes will cool down the water a bit, so turn up the heat until the water gets boiling again and then you can let the jars simmer. Mom’s recipe says 20 minutes for pints and 30 minutes for quarts. Don’t mess with the jars in the pot. The first year I canned tomatoes, I got worried seeing air bubbles coming out of the jars, but that’s just part of the process and what makes the vacuum to help the jars seal. When the cooking time is up, lift the jars out of the pot with the canning tongs, and place them on a cloth on the counter to cool. Once again, don’t mess with them. Just let them sit until cool. As the jars begin to cool down, you will hear a “ping”. This is the final sealing of the jars. After the jars are completely cool, test the seal by gently pushing down on the center of each jar lid. If there is no “give”, that means the jar is sealed. In the rare case that the lid easily moves up and down, that means the jar isn’t sealed. 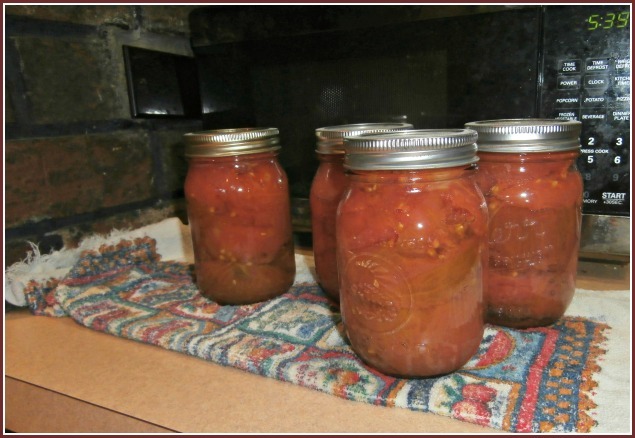 At this point, you have two choices, start the canning process over with a new lid and 20 more minutes of cooking time, or put the jar in the refrigerator and use the tomatoes within a few days. Making home-canned tomatoes is one of the least involved canning processes. Whether you can just a couple of jars or a couple dozen, there will be a lot of satisfaction in preserving some fresh produce from your own garden. Then some cold day in the fall or winter, you’ll have the special treat of opening a jar to make your favorite spaghetti sauce or chili with tomatoes that still have that home-grown flavor, something that the store-bought just doesn’t give.